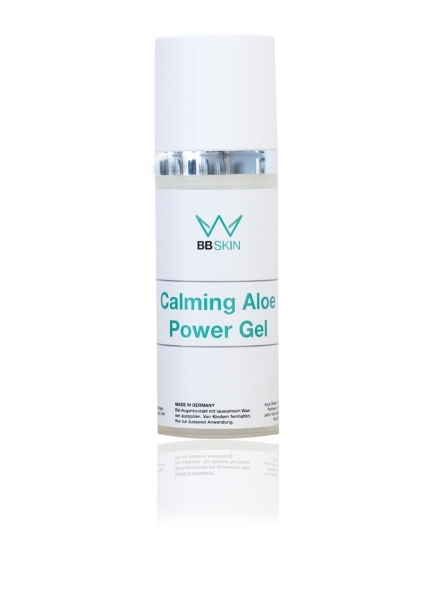 Our Calming Aloe Power Gel is a real miracle cure! It can be used not only for sunburn, but also for irritated skin. For this reason we like to use it in our BB Skin or Microneedling treatment. Due to the aloe vera extract it has a moisturizing and regenerating effect. It has an antibacterial, anti-inflammatory effect. Provitamin B5 and allantoin have a smoothing, vitalising and calming effect. Aqua, Aloe Barbadensis Leaf Juice , Allantoin, Urea, Panthenol, Glycerin, Serine, Sorbitol,Sodium, Lactate, Lactic Acid, Sodium Carbomer, Sodium Chloride, Pentylene Glycol, Ethylhexylglycerin, Phenoxyethanol.